Ageing is a complex biological process, driven by the build up of damage in our cells, tissues and organs. 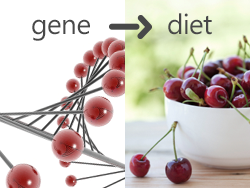 This damage is accumulated by a mixture of how we live our lives and the genetic mechanisms that repair that damage, making nutrition and lifestyle an irrefutable factor in the ageing and disease process. New research has discovered that just 20 minutes of activity can alter the DNA in your muscle cells, making them work better for further exercise. It has also been found that certain genes are boosted in their ability to metabolise sugar and fat, as well as regulate glucose (blood sugar) levels. These positive DNA effects increase as the intensity of the exercise does. You can greatly improve your health outlook by simply changing certain environmental factors to which you expose your body – specifically, by avoiding harmful compounds (such as harmful trans fats and large amounts of sugar and salt) and including more protective polyphenols (powerful antioxidants found in colourful fruits and vegetables). Every little helps!